This entry was posted on May 12, 2013 at 9:08 am	and is filed under Election 2010, Leadership, Legal, Politics. You can follow any responses to this entry through the RSS 2.0 feed. You can leave a response, or trackback from your own site. Today’s Star says that Morris is now suing the Town of Aurora to cover her court costs. What do we call this….SLAPP II? Thank you for posting this letter. Mayor Dawe’s strong Anti Slapp stance is much appreciated by this Aurora resident. Although we need to put this mess behind us, we cannot afford morally, ethically and financially to forget or repeat these actions. Good to see some community leaders have the guts to apologize. It’s the least the town could have done. Too little & way too late. But very welcome nonetheless. Special thanks to Councillor Thompson for digging his heels in when the going got rough. What I find hard to beleive is that this “apology” had to be done at all. Let’s be honest, Bill Hogg (a defendant in the suit, the owner of this site and a campaign worker for Dawe) did not need an apology from Dawe. Dawe did not do anything. It was the previous council that did this. This apology is just as hollow as the apology from the Feds to the Japanese civilians during the war. The current government did not contribute to their situation. It is all history. Just a waste of paper and bandwidth. Long overdue, but finally some measure of ownership by the town in acknowledging their part in this baseless lawsuit. 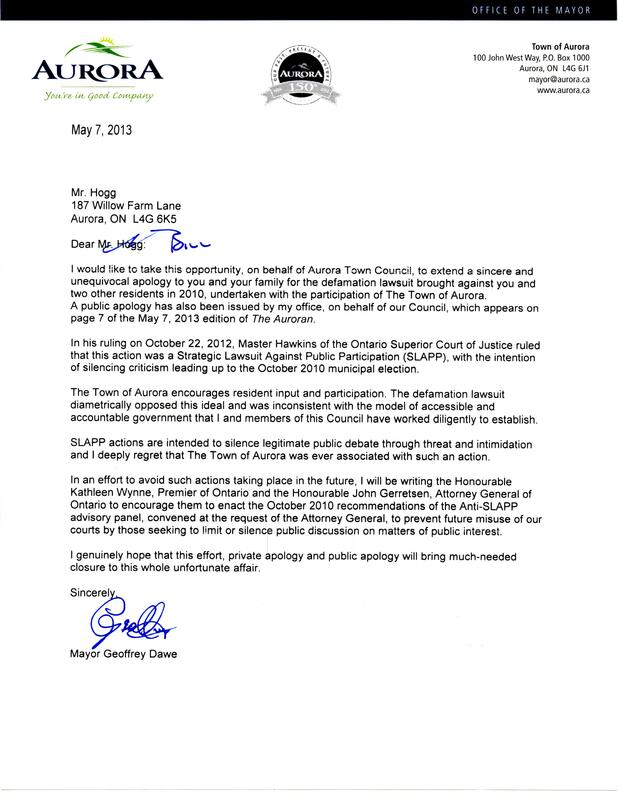 I’m relieved to see that the majority of this current council have the the true integrity to stand up and apologize to the Hogg, Johnson, and Bishenden familes for the pain and suffering so needlessly and spitefully inflicted upon them. What’s not surprising to see is those same 3 councilors, Ballard, Gallo, and Gaertner, continue to insult the citizens of Aurora through their actions both past and present, in this matter.